Ross fired County two up against the Dons before Niall McGinn's consolation, with Mark Reynolds' own goal having given the hosts the lead. 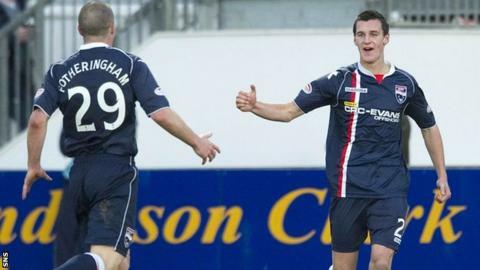 "I thought he was exceptional at times," Adams told BBC Scotland. "Steven's got a good future in the game, it was good for him to get a goal." For Ross it was a first goal in senior football and Adams was also pleased with his side's overall performance. "I've seen him finish like that in training and in games and he stuck it past [Jamie] Langfield and he had no chance," added Adams. "A very good performance for us and I'm delighted to get the win, especially at home and especially against Aberdeen - a team that's riding high. "Aberdeen started the game particularly well, we coped with it well and we scored a goal from a set piece, which is always pleasing. "We knew they would have a lot of possession but, chances-wise, they didn't really create much. If they created something it was a mistake by one of us. "Second half, we performed well and were able to get further ahead."